Washington D.C. Maps - map of Washington D.C.
VanDam's newly released 2019 MALLSMART WASHINGTON DC­ Edition maps all top attractions including museums, memorials, monuments, major architecture, hotels, the Smithsonian, government and association buildings, the National Mall and the Metro system for all of Washington DC at an immensely legible super-scale of 1:9,500 complete with 3-D building illustrations. Clear information design allows you to read the map from three feet away and has earned VanDam maps a place in the MoMA Collection. The map is film-laminated, accordion folded and pocket size. Dimensions: 4 x 9 folded, 9 x 24 unfolded, fits into shirt pocket or purse. 2019 MALLSMART WASHINGTON DC is so legible you will instantly understand the National Mall and how it connects to other parts of the District and Old Town Alexandria. You get God's perspective on Monument City as well as the minute details. This 18th Century city grid with grand diagonal avenues designed by Pierre L'Enfant is a metaphor for the division of power in the Republic. A right triangle with Pennsylvania Avenue as hypotenuse and grand connector between the Executive (White House) and the Legislature (Congress) with the Judiciary (Supreme Court) backing up to Congress on Capitol Hill. The Washington Monument describes the triangle's Western point and serves as your compass needle to navigate the Capital. 2019 MALLSMART WASHINGTON DC includes a stunning dimensional Mall detail of the central city from Arlington National Cemetery through Foggy Bottom, Federal Triangle, Judiciary Square, Penn Quarter, Chinatown, Downtown, the East End and Capitol Hill. Restrooms and concessions are clearly marked. Separate Beltway and Metro DC maps insure you have everything you need for a successful trip. While politics in the Capital may be petty and divisive, the riches of art, science and culture offered in its museums almost all of them free are generous, conciliatory and un-equalled anywhere else. The hot ticket in town is the new African American Museum of History and Culture. Its bronze colored corona architecture boldly breaks the mold of the mostly white neo-classicist structures on the Mall and offers an intriguing perspective on American history. On the West Mall history is made manifest in the placement of the MLK Memorial where Dr. King stares down Jefferson with Lincoln's backing. 2019 MALLSMART WASHINGTON DC map scale of 1:9,500 makes you feel you are there with 3D buildings illustrations as your compass. All Metro stops are marked by their respective line in context right on the main map and on a separate subway overview so you know both the local details and understand the larger system. Stephan Van Dam, the map designer and publisher has mapped the Capital for the Smithsonian, The National Gallery and the National Park Service. We also publish a series of Presidential History Maps Lincoln, Jefferson and Washington as well as WDC Pop up Map. 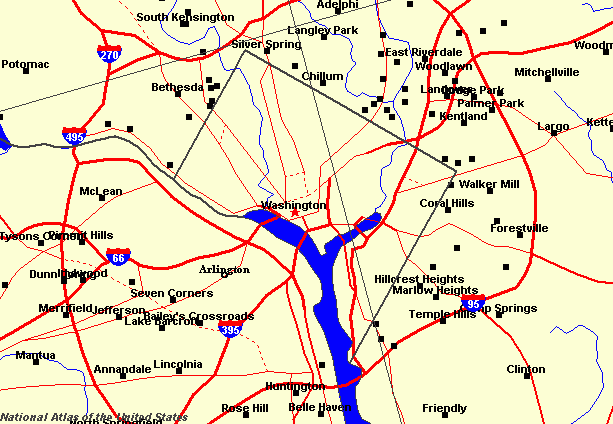 2019 MALLSMART WASHINGTON DC maps are updated at least twice a year and are more current than any other map available. Its film lamination is extra durable and will last you for your next trip. A customer recently suggested our maps are too good but we like quality that lasts. Simplicity reigns supreme to make complex cities clear and understandable. Our typography creates character and reveals the true bones of the vertical city. VanDam uses a letter grid to identify locations on maps - no confusing and cluttering K-28 or V-34s - its just the city from A-Z. Our covers map the icons of each city and turn them into collectible graphic art. Each sleek and laminated city map package opens to 24" x 9" and then easily folds down to 4" x 9" to snuggly fit into a shirt pocket. VanDam's 2019 Washington DC StreetSmart maps all top attractions including museums, major architecture, hotels, monuments, federal buildings, and shopping destinations - all at an immensely legible super-scale of 1:16,000, complete with 3-D building illustrations. Clear information design allows you to read the map from three feet away and has earned VanDam maps a place in the MoMA Collection. The map is film-laminated, accordion folded and pocket size. Coverage: Mall Map: 1:10,000, Washington DC Street Map: 1:16,000, Adams Morgan Map 1:16,000, Old Town Alexandria Map 1:24,000, Howard U map: 1:20,000, Beltway Map: 1:238,000, Capital MetroTransit Map Dimensions: 4 x 9 folded, 9 x 24 unfolded, fits into shirt pocket or purse. STREETSMART WASHINGTON DC is so legible you will instantly understand the National Mall and how it connects to other parts of the District and Old Town Alexandria. You get God's perspective on Monument City as well as the minute details. This 18th Century city grid with grand diagonal avenues designed by Pierre L'Enfant is a metaphor for the division of power in the Republic. A right triangle with Pennsylvania Avenue as hypotenuse and grand connector between the Executive (White House) and the Legislature (Congress) with the Judiciary (Supreme Court) backing up to Congress on Capitol Hill. The Washington Monument describes the triangle's Western point and serves as your compass needle to navigate the Capital. STREETSMART WASHINGTON DC includes a stunning dimensional Mall detail of the East Mall from the White House to Capitol Hill. Restrooms and concessions are clearly marked. Separate Adams Morgan, Old Town Alexandria, Howard University, Beltway and Metro DC maps insure you have everything you need for a successful trip. While politics in the Capital may be petty and divisive, the riches of art, science and culture offered in its museums almost all of them free are generous, conciliatory and un-equalled anywhere else. The hot ticket in town is the new African American Museum of History and Culture. Its bronze colored corona architecture boldly breaks the mold of the mostly white neo-classicist structures on the Mall and offers an intriguing perspective on American history. On the West Mall history is made manifest in the placement of the MLK Memorial where Dr. King stares down Jefferson with Lincoln's backing. STREETSMART WASHINGTON DC map scale of 1:16,00 makes you feel you are there with 3D buildings illustrations as your compass. All Metro stops are marked by their respective line in context right on the main map and on a separate Metro overview so you know both the local details and understand the larger system. Stephan Van Dam, the map designer and publisher has mapped the Capital for the Smithsonian, The National Gallery and the National Park Service. We also publish a series of Presidential History Maps Lincoln, Jefferson and Washington as well as WDC Pop up Map. STREETSMART WASHINGTON DC maps are updated at least twice a year and are more current than any other map available. Its film lamination is extra durable and will last you for your next trip. A customer recently suggested our maps are too good but we like quality that lasts. Simplicity reigns supreme to make complex cities clear and understandable. Our typography creates character and reveals the true bones of the vertical city. VanDam uses a letter grid to identify locations on maps - no confusing and cluttering K-28 or V-34s - its just the city from A-Z. Our covers map the icons of each city and turn them into collectible graphic art. Each sleek and laminated city map package opens to 24" x 9" and then easily folds down to 4" x 9" to snuggly fit into a shirt pocket. Streetwise Washington, DC Map is a laminated city center map of Washington, DC. The accordion-fold pocket size travel map has an integrated mall map & metrorail map featuring lines & transfer stations. Yes, Washington D.C. is home to streets and avenues of Greco-Roman inspired architecture, unrivaled (and free) museums and, of course, unique monuments, but it is the political presence you feel the most. This is the Superbowl stadium for every past or present player in the game of politics. The Mall serves as center field, with Lincoln, Jefferson, the WWII and Vietnam Memorials on one end, reminding us of the past battles this city has seen, and Congress, confronting current issues, looming at the other end. In between, the White House stands ready to take the field while the Supreme Court sits back waiting to settle the inevitable skirmishes that arise. Surrounding them are the supporting players, the Treasury, The Library of Congress and all the various Departments that run every feasible aspect of public life. Meanwhile, Washington Cathedral stands ready to console the battered and bereaved. All of this is clearly laid out for you on the STREETWISE® Washington DC Street Map. Sites, whether political or not, are listed as well as hotels, transportation and parks. A separate inset of the Mall details each site. You can find relief from the political playoffs by getting outside of the city and into the bucolic region of the Mid-Atlantic, as seen on the Washington DC Area map. The pocket size map of Washington D.C. is laminated for durability and accordion folding for effortless use. To enhance your trip to Washington DC, pick up the Michelin Green Guide Washington DC which details the star-rated sites and attractions so you can prioritize your trip based on your time and interest. In addition, for the best selection of restaurants, buy the MICHELIN Guide Washington DC. Product Details Measures 9.5" x 4" and folds out to 40" x 28". Rand McNally's folded map for Washington, D.C. is a must-have for anyone traveling in and around this part of District of Columbia, offering unbeatable accuracy and reliability at a great price. Our trusted cartography shows all Interstate, U.S., state, and county highways, along with clearly indicated parks, points of interest, airports, county boundaries, and streets. The easy-to-use legend and detailed index make for quick and easy location of destinations. You'll see why Rand McNally folded maps have been the trusted standard for years. Product Details: Measures 9.5" x 4" and folds out to 40" x 28". Streetwise Washington DC Metro Map is a laminated Washington DC Metrorail Map which conveniently folds to a pocket & wallet size metro map for travel. If you're going to Washington DC and your visit is limited to the sites around the mall then the STREETWISE Washington DC Metro Map is the perfect map for you. Small and compact (it folds down to a size a bit larger than a credit card) this map shows you all of the sites located on and near the Mall such as the Museum of American History, the National Gallery of Art, the Capitol building and the White House. From the Lincoln Memorial to the Capitol building, from Tidal Basin to Blair House, this Mall map has it all on one side, with a complete color coded map of the quiet and efficient Metrorail on the reverse side. Everything you need to take in the epicenter of Washington DC. Our pocket size metro map of Washington DC is also laminated for durability and accordion folding for effortless use. VanDam's 2019 Washington Presidential Map is both a laminated street map to the Capital and a handy history chart of the life of our first President George Washington. The history map puts his personal geography into the context of his age. The street map covers all attractions including museums, monuments, tourbus stops and restrooms on and around The Mall. Perfect for class trips where students can remember what they saw. The 2019 Washington Presidential Map life map details his trajectory from British soldier, surveyor, land and slave owner, signer of the Declaration of Independence, commander in chief during the Revolution War, leader of the Constitutional convention, and First President of the new nation. A must-have for every history buff and visitor to the Washington Monument who wants to understand why we honor this man. This special Capital Edition includes detailed maps of the Mall, Downtown Washington DC, Foggy Bottom, Chinatown, featuring all museums, memorials, federal buildings and more at an immensely legible scale with 3D buildings. VanDam's Presidential Maps make history accessible, portable and understandable to wide audiences of all ages -- from history buffs to casual Mall visitors. A 3D graphic of the Washington Monument gives insights into the construction of what is arguably the nation's most important monument. This sleek laminated map package refolds easily to 4" x 9" (from 32" x 9" open) and snuggly fits into your pocket. The smartest and most memorable souvenir around. This map was produced in conjunction with the US National Park Service. VanDam's new 2018 WASHINGTON DC POP-UP maps all of DC's attractions, neighborhoods, museums, hotels, historic sites, and more at an immensely legible scale complete with 3-D building illustrations. Each of the two Pop-Up map unfolds to 12 times its original size, then refolds automatically when the covers are closed. Size open is 8.5 x 11 per section; 3.75 x 6 closed. Eminently clear information design allows users to read the map from three feet away. Coverage: Mall Map: 1:10,000, Washington DC Street Map: 1:16,000, Beltway Map: 1:238,000 Capital Metro Transit Map Dimensions: 3.75 x 6 folded, 8.5 x 11 unfolded for each of two maps, fits into shirt pocket or purse. WASHINGTON DC POP-UP is so legible you will instantly understand the National Mall and how it connects to other parts of the District and Old Town Alexandria. You get God's perspective on Monument City as well as the minute details. This 18th Century city grid with grand diagonal avenues designed by Pierre L'Enfant is a metaphor for the division of power in the Republic. A right triangle with Pennsylvania Avenue as hypotenuse and grand connector between the Executive (White House) and the Legislature (Congress) with the Judiciary (Supreme Court) backing up to Congress on Capitol Hill. The Washington Monument describes the triangle's Western point and serves as your compass needle to navigate the Capital. WASHINGTON DC POP-UP includes a stunning dimensional Mall detail of the Mall from the Lincoln Memorial to Capitol Hill. Restrooms and concessions are clearly marked. Separate Washington DC Street, Beltway and Metro DC maps insure you have everything you need for a successful trip. While politics in the Capital may be petty and divisive, the riches of art, science and culture offered in its museums almost all of them free are generous, conciliatory and un-equalled anywhere else. The hot ticket in town is the new African American Museum of History and Culture. Its bronze colored corona architecture boldly breaks the mold of the mostly white neo-classicist structures on the Mall and offers an intriguing perspective on American history. On the West Mall history is made manifest in the placement of the MLK Memorial where Dr. King stares down Jefferson with Lincoln's backing. WASHINGTON DC POP-UP map scale of 1:16,00 makes you feel you are there with 3D buildings illustrations as your compass. All Metro stops are marked by their respective line in context right on the main map and on a separate subway overview so you know both the local details and understand the larger system. Stephan Van Dam, the map designer and publisher has mapped the Capital for the Smithsonian, The National Gallery and the National Park Service. We also publish a series of Presidential History Maps Lincoln, Jefferson and Washington as well as this WDC Pop up Map. WASHINGTON DC POP-UP maps are updated at least twice a year and are more current than any other map available. Its film lamination is extra durable and will last you for your next trip. A customer recently suggested our maps are too good but we like quality that lasts. Simplicity reigns supreme to make complex cities clear and understandable. Our typography creates character and reveals the true bones of the vertical city. VanDam uses a letter grid to identify locations on maps - no confusing and cluttering K-28 or V-34s - its just the city from A-Z. Our covers map the icons of each city and turn them into collectible graphic art. Each sleek and laminated city map package opens to 11" x 8.5 " and then automatically folds down to 3.75" x 6" to snuggly fit into a shirt pocket when the covers are closed. Rand McNally's folded map for Washington, D.C. is a must-have for anyone traveling in and around the Washington, D.C. area, offering unbeatable accuracy and reliability at a great price. Our trusted cartography shows all Interstate, U.S., state, and county highways, along with clearly indicated parks, points of interest, airports, county boundaries, and streets. The easy-to-use legend and detailed index make for quick and easy location of destinations. You'll see why Rand McNally folded maps have been the trusted standard for years. Measures 9.5' x 4' and folds out to 40' x 28'. Discover the many magnificent monuments and museums of America's capital, Washington DC, with the help of this genuinely pocket-sized, pop-up map. From the elegant Neo-classical architecture and poignant memorials to the sweeping grandeur of The Mall this little map will help you get around. Small in size yet big on detail, this compact, dependable, Washington DC city map will ensure you don't miss a thing. Ideal to pop in a pocket or bag for quick reference while exploring the political and cultural heart of America. Durable and waterproof, with a handy slipcase and an easy-fold format, Lonely Planet Washington DC City Map is your conveniently-sized passport to traveling with ease. Get more from your map and your trip with images and information about top city attractions,& transport maps, itinerary suggestions, extensive street and site index, and practical travel tips and directory. With this easy-to-use, full colour navigation tool in your back pocket, you can truly get to the heart of Washington DC, so begin your journey now! Check out Lonely Planet Washington DC, our most comprehensive guidebook to the city, covering the top sights and most authentic off-beat experiences. Or check out Lonely Planet Pocket Washington DC, a handy-sized guide focused on the can't-miss experiences for a quick trip.